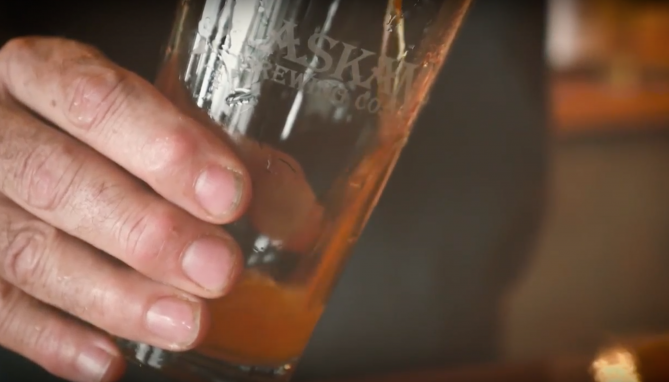 A bartender pours a glass of Alaskan Brewing Amber beer, inspiring the diner to flashback to a day of fishing. The sequence could be either a vision of fishermen out at sea, reeling in the cod that would become the fish and chips later pictured in the video, or the diner’s memory of a day spent commercial fishing. Scott leaves that open for the viewer to interpret themselves, giving the opportunity for everyday Alaskans and commercial fishermen to connect to the video in an emotional way. Scott spent a day on the Sonder, a pot cod fishing vessel, shooting the commercial fishing scene. Special thanks to Sid Wolford and his crew for putting up with a photographer crawling around on deck that day. The opening and closing scenes take place at the Chartroom restaurant at Lands End on the Homer Spit. Thanks to the Chartroom staff and their picture-perfect fish and chips and beer pours. Thank you to Dan Redfield with Hybrid Color Films for an incredible editing job.